Agadez – Fifty community mobilizers, or ‘MobCom’ for IOM, the UN Migration Agency, in Niger, from Arlit, Dirkou, Niamey and Assamaka, recently (17/09) participated in a one-week workshop in Agadez, which focused on building their capacities as communicators. IOM has been implementing outreach activities in Niger since 2016 when the first orientation office opened in Agadez. Prior to opening the office, the informal discussions held with migrants at the transit centres and in the ghettos showed a lack of knowledge and misinformation about the length, conditions and risks of the route to Libya and Algeria, and further, to Europe. “It has been quite a journey since then. We have improved both our techniques and our presence. People know us and trust us now,” said Azaoua Mahaman, from IOM’s Orientation Office in the Agadez region. 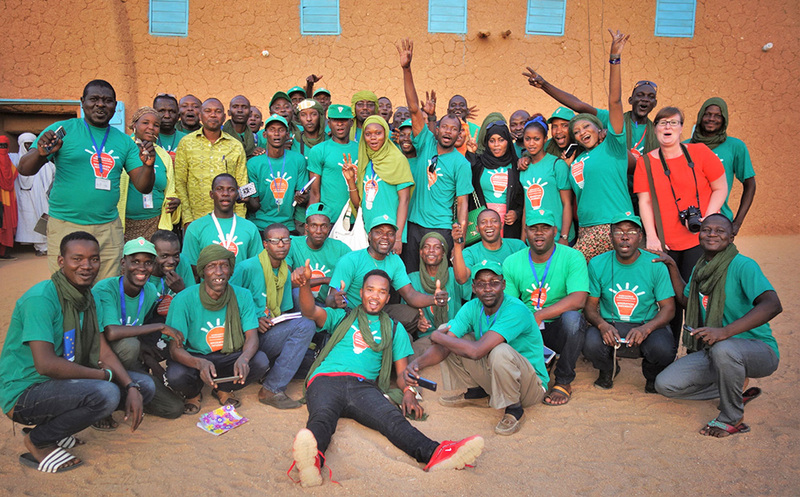 The four orientation offices in Niger in Agadez, Arlit, Dirkou and Niamey, together with their over 50 community mobilizers, are responsible for implementing the national awareness strategy developed by the mission, through various outreach activities. More than 170,000 people have been sensitized regarding irregular migration and its alternatives since 2016, with close to 100,000 in 2018 alone. The orientation offices provide access to objective information on safe migration, including individual counselling, to both migrants in transit and host communities. The MobComs, both Nigerien and third-country nationals, often migrants like Hadiza themselves, build trust with local communities and migrants through their regular sensitization sessions. “Awareness is a somewhat broad term, yet intuitively widely understood,” said Stephanie Eeckman, Community Outreach Officer at IOM Niger. “As part of a continuous and interactive communication flow, awareness-raising is a process that opens up opportunities for information exchange and develops the skills and abilities needed to enable change,” Eeckman added. To achieve a change that can effectively influence migration decisions, IOM Niger developed a participatory approach to awareness-raising based on behaviour change communications (BCC), which in turn is based on interpersonal communication (IPC) that can ultimately contribute to social change. The MobComs inform migrants about the risks of irregular migration and its alternatives, and IOM’s mandate and its assistance. Ultimately, the MobComs seek to ensure that migrants and community members can make informed decisions. A whopping 83 per cent of migrants at IOM’s transit centres have heard about IOM’s mandate and assistance through a community mobilizer carrying out a sensitization session. If referred to one of IOM’s six transit centres in Niger, the migrants are assisted with meals, shelter, medical and psychosocial assistance, assistance with their travel documents and transportation to their countries of origin. Fifty-five per cent of the migrants sensitized in 2018 decided to join IOM’s assisted voluntary return and reintegration (AVRR) programme. Recently, IOM deployed two MobComs to Assamaka, from where most distress calls took place in 2018. The MobComs play a pivotal role in search and rescue operations as first responders for distress calls. The two days of theoretical training were followed by two days of basic participatory theatre techniques. The workshop ended with practical sessions in the ghettos in Agadez, where the MobComs put to practice their newly learned skills. The retreat was also an opportunity for the community mobilizers to exchange and learn from each other about their respective contexts as well as to take advantage of these exchanges to develop new and innovative approaches. “Before, I could go to Niamey and meet a community mobilizer and not recognize him. Now we know each other, so we can work well together. We are ready to go back and use the skills we have acquired here in our day to day outreach activities for migrants,” said Dan Ballan Mahamn Sani, a Community Mobilizer in Arlit. IOM’s outreach activities through the four orientation offices in Niger are supported by the Danish International Development Agency (DANIDA), and the EU-IOM joint initiative for migrant protection and reintegration which, together with the Migrant Resource and Response Mechanism (MRRM) programme, is funded by the EU Emergency Trust Fund for Africa. Workshop for Community Mobilizers in Niger | Fifty community mobilizers in Niger recently participated in a one-week workshop in Agadez, which focused on building their capacities as communicators.